Here lies an ol’ pal, Textbook O. Mine. that he’s reached the end of his line. 1 out of 4 college students in 2012 owns an iPad or similar tablet device; up from 7% a year ago. 17% of high school seniors own an iPad in 2012; quadruple the 2011 figure of 4% ownership. 63% of college – and 69% of high school – students believe that tablet devices will replace textbooks by 2017. 36% of college – and 25% of high school – students plan to buy a tablet device in the next 6 months. 63% of college students are considering the Apple iPad, compared to 26% Kindle Fire and 17% Samsung Galaxy Tab. 70% of college students have used a digital textbook. 58% prefer a digital textbook to a print version; a switch from last year where the same percentage preferred print. According to the survey, the above statistic holds true for high school seniors as well. 90% believe that tablets are a valuable tool in the educational experience. 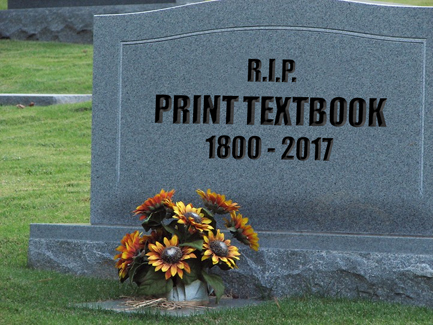 What do you think about the battle that appears to be imminent between digital and print textbooks? Cast a vote and/or leave an expanded comment below. We want to know what you think. News: Apple to Enter e-Textbook Market? The invitation was cryptic, but significant. Could it change the skyline of the U.S. textbook industry? Watch and see. Apple has a date with the Big Apple. Wednesday the 19th. 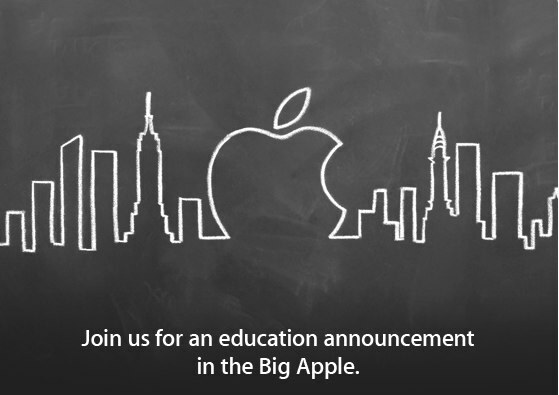 Apple announced an education event in the Big Apple scheduled for next week. Speculation is abound that Apple will unveil a new iBooks for education program. Some say it will have an impact that rivals the splash made by iTunes in the music business about a decade ago (CDs are on their last leg, just in case you haven’t noticed). Many conjecture that the new program will be designed for use on the iPad, and will provide tablet-toting students with weightless e-textbooks that incorporate interactive features. Walter Isaacson, the official biographer of the late Steve Jobs, was first to hint at this as he cited Jobs’ plan to circumvent state certification of textbooks by making them free to the public on the iPad. In his book, Issacson indicates that Jobs planned to hire textbook writers to create electronic interactive versions for the iPad. Pearson Education has been speculated to be the first major company to cooperate with Apple on such a project. The education world will be tuned in. With a plethora of options, it wasn’t easy to select just one title for my book study. In a way I cheated…I chose a book with 23 contributing authors and clearly divided chapters. Some of them I was familiar with: Howard Gardner, Cheryl Lemke, Alan November, Bob Pearlman, Douglas Reeves, and Will Richardson. Many I wasn’t. One thing is for sure, I’m going to get exposure to lots of different viewpoints and ideas relating to 21st century skills with this book. I’m going to discuss some of the highlights as I read the book, one author (or chapter) per post. I’m starting with Ken Kay, president of the Partnership for 21st Century Skills – the nation’s leading advocacy organization for the cause of educational evolution. Doing well in school no longer guarantees a lifelong job or career as it did for previous generations of Americans. Today, people can expect to have many jobs in multiple fields during their careers…The new social contract is different: only people who have the knowledge and skills to negotiate constant change and reinvent themselves for new situations will succeed…Proficiency in 21st century skills is the new civil right for our times. I believe Kay is simply stating that we, as a school, can no longer focus our efforts on imparting massive amounts of knowledge on our students. We have to add two more goals to our agenda: they must be able to adapt to change and they must be able to cast themselves in new roles with the same skill set. 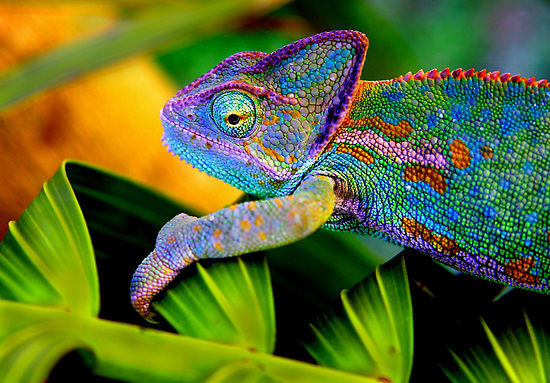 School is now about knowledge AND adaptability. Any employee who needs to be managed is no longer employable. Kay indicates that a manager at Apple made this strong statement to him. Obviously, Apple is a company founded on innovation; one that has probably always expected its employees to take initiative while granting them autonomy to do their job in creative ways. But in the 21st century, it won’t just be science and tech companies that expect this of their employees. It will become the norm. Global awareness is a new essential in the global economy…Financial, economic, business, and entrepreneurial literacy are new imperatives…Creativity and innovation, flexibility and adaptability, leadership and cross-cultural skills…These are the kinds of skills that set people apart. Wow! That hits the nail right on the head. If I were to try painting a vision in your of the 21st Century Charger, tossing his or her cap in the air about to embark on life after “The Hall,” I couldn’t have selected the descriptive terms any better. If our students matriculate to college with the skills Kay mentions above, watch out world! Rigor traditionally is equated with mastery of content alone, and that’s simply not good enough anymore…However, in the 21st century, the true test of rigor is for students to be able to look at material they’ve never seen before and know what to do with it. Infusing 21st century skills into core subjects actually rachets up the rigor. In a nutshell, in the quest to ensure rigorous curriculum, we must now include the 21st century skills mentioned in the previous statement. Kay drives home the point again…knowledge isn’t enough…it takes the right skill set and adaptability to prepare our students for success in the 21st century. I am so excited to be teaching at a school that gets that, during a time when this important shift is taking place. We are ahead of the game, my friends. And the future is bright. Put on your shades and let’s get to work.